JIM MORFINO: Paulie Soda was a loser. He was a gambler and he hated the Yankees. KING KAUFMAN: We start this episode with our first story from a listener. We’re going to go to Fat Nick’s Candy Store in the Bronx and meet Paulie Soda and Jackie Pads, so named because he padded his suit with dish towels. It didn’t look right for a connected guy to look too skinny. You see, like every other candy store in the Bronx in 1953, Fat Nick’s was really a bookie joint. MORFINO: My name is Jim Morfino. I’m 74 years old. And the story that I was calling in about was about my experiences growing up in Fat Nick’s candy store in the Bronx. We had a lot of gamblers there. And one of the gamblers is a guy that we all called Paulie Soda. He used to be a soda delivery guy and one of the customers on his route was Fat Nick’s candy store. Nick was a pretty successful bookmaker, and he made sandwiches for the guys hanging around the store and the kids after school. Nick used to sit on a wooden milk carton behind the counter and there was peppers and eggs. He used to make peppers and eggs every day, and the guy stunk. He never washed. He was obese. What do you call it, morbidly obese? He was obese. We stayed at Fat Nick’s, we watched the cast of Damon Runyon charachters. They were all connected guys. And we learned about life other than what you learned in school. We had a great street education. Paulie, he was, I guess the word would be he was an iconoclast. Anyone that was successful, he was against. And when it came to gambling, he bet against the Yankees day in and day out. He was forever in a hole to Nick. Now the Yankees in the early 1950s, they were the dynasty of all dynasties. And in 1953, probably the worst team in baseball was the St. Louis Browns. The Yankees were on a tremendous winning streak. They had won 18 games in a row. And meanwhile, the Browns were in the middle of a 14-game losing streak. Well, this one particular afternoon, Paulie decides, he comes in, he owes Nick money, he gives him some soda to take care of some of the bet, and he bets against the Yankees. The guys in the store start getting all over him but Jackie — Jackie Pads, was a connected guy and he was one of the leaders of the group that hung around the candy store. Pads, he feels sorry for him and he tells everybody “Shut up. Just stop it. Stop it.” And everybody listens to him, right? And Jackie decides to play the benevolent patriarch, if you will, and he takes Paulie aside and he’s trying to tell him “You’ve got to stop this insanity, betting against the Yanks. They’re playing the Browns. The Browns are on a losing streak.” They were a dog team, the Browns. So Pads convinces Paulie to bet the Yankees. It was the only time he ever bet the Yankees, right? And the Yankees were playing later in the afternoon, so Paulie could finish his route and then get home and watch the game, right? When the Yankee game comes around, we heard, from outside the store, we heard this insane bellowing coming out of Fat Nick’s. It was Paulie Soda, because at about 5:30 that afternoon, the horrible, inept Browns had just beaten the Yankees 3 to 1. Paulie, he was like a man possessed. He was spitting, cursing in Italian and English. He was ranting at the walls and the ceiling. I mean, it was the only time he that ever bet the Yankees, and they end up losing to the dogs, and now hes deep in debt, he can never get out of it. And, in irony of ironies, when Fat Nick dies, there’s nobody that wants to take the store. Who do you think takes over the candy store and buys it? Paulie Soda takes the candy store! He starts to bookmake. KAUFMAN: James Morfino. He’s retired from the Diplomatic Courier Service. His is the first of three stories in this episode. We’ll also hear about an American playing pro football in Mexico — American football. Juan Reyes with that story. And I’ll introduce you to Johnny Rawls, the singer of our theme song — Can’t Win 4 Losing. Let’s get the last word on Paulie Soda. MORFINO: You can use the biblical analogy: It was like the lame walking after being touched by the Messiah. All the losers betting against Paulie Soda? They all became winners for the first time in their lives. This guy is such a loser that he ends up losing the store. I’m telling you, in my almost 60 years of gambling, Paulie Soda is the only bookmaker I ever heard of who went broke. The guy was a loser to the end. A loser to the end. 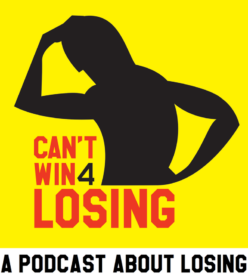 KAUFMAN: I’m King Kaufman, and this is Can’t Win For Losing, a podcast about losing. In this episode: professional football in Mexico. And I don’t mean soccer. Juan Reyes reports from Mexico City. Plus: Meet a guy who didn’t write the book on losing, but he wrote the song. Johnny Rawls, the Mississippi bluesman who sings this show’s closing theme. Tape up your ankles, it’s gonna be a bumpy ride. THIS, is Can’t win for losing. Pro football in Mexico story and Johnny Rawls story: Transcript soon.